Due to the technical nature of the SEO industry and its relative immaturity compared to other technologically advanced marketing disciplines, many SEOs still spend a significant percentage of their time on manual tasks. Conductor analyzed the day-to-day life of an SEO professional, determined the tasks that could be automated, and quantified the resulting increase in productivity by using SEO technology. 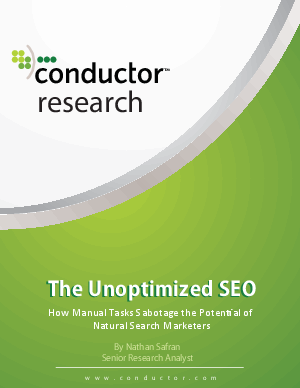 Download this research paper to learn how new technology can tremendously increase an SEO marketer’s output.